The dusting of colonies with powdered sugar as a means of varroa control has become quite popular with hobbyists. Unfortunately, there is precious little published data in support of its actual efficacy in the field. So we here at Still-on-the-Learning-Curve Apiaries decided to put it to the test. Author’s note: My readers have likely noted that I follow the published scientific research relating to beekeeping closely, and that I have the greatest respect and appreciation for our dedicated bee researchers worldwide. Upon occasion I find that there are important practical questions for which I can’t find the answers. In those instances I may run small controlled experiments myself to obtain necessary data. I hope that any results that I publish will be expanded upon by researchers with more expertise and resources than I have. In a previous article (Oliver 2007) I reviewed the use of powdered sugar dusting for varroa mite management. In brief, Dr. Kamran Fakhimzadeh had followed up on reports of using various dusts to cause phoretic (hitchhiking) varroa mites to drop off the bees. He found that powdered sugar was just the right size for sticking to the mites’ footpads, plus had the added advantage of not adding any unwanted contamination to the hive. His research demonstrated that dusting with powdered sugar could effectively increase mite drop from a colony. This research was confirmed by Dr. Marion Ellis and Nick Aliano. Jerry Hayes recommended its use in the hot Florida climate. I reviewed the data of several hobbyists who had kept records of mite drops with sugar dusting over time (thanks especially to my nearby friend Janet Brisson), plus experimented myself with various methods of application. I found that by using a cup taped to a bee brush, plus a ¾” wooden rim holding a piece of window screen, that we could dust colonies in less than 30 seconds. We also found that by using one cup of very dry powdered sugar per box, the method effectively dusted most of the bees in either single or double deep colonies. Please note: the small amount of corn starch in commercial powdered sugar will not harm your bees. The author and son dusting one of our beeyards. First we slide dry white boards under the screened bottoms of each colony. Then one person leads, popping lids, and smoking the bees off the top bars. The second person follows and dusts. Then the first returns to replace the lids. By them time we’ve finished 36 colonies, 10 minutes has elapsed, and we can pull the dry boards to check for mite drop. This gives us a fairly accurate indication of the mite load of each colony. The question remained as to whether the amount of mites removed by dusting would actually control varroa populations. In order to mathematically model the effect of dusting, first I needed to determine what percentage of phoretic mites would actually be dislodged. So I obtained a weak and collapsing colony of bees (approx. 4 frames of bees and 1½ frames of brood) and placed it onto a screened bottom. I measured natural mite fall levels for the two days prior to the test by inserting Crisco-coated sticky boards without smoke (with virtually no disturbance to the colony). The test was performed on November 25 in late afternoon at approximately 55°F. Flying bees were returning to the colony, and the bees were moderately clustered. I sifted ½ cup of powdered sugar over the top bars of the frames occupied by bees, and brushed it between the tops of the frames with a bee brush. I then replaced the colony cover. After 1 hour, I removed the sticky board, then removed each frame of bees, and shook and brushed the bees into a tub of water containing Cascade dishwashing detergent (few bees were lost, since the temperature had dropped by then). Subsequently, I washed the mites, powdered sugar, and Crisco off the sticky board and through a fine sieve to capture the mites. All mites were stored in alcohol for later counting. I washed the bees similarly with detergent water, and rinsed them over a coarse sieve into a fine sieve to catch the mites. I repeated the procedure for five washings, until no more mites were obtained. The bees were then preserved in alcohol (and later washed again to confirm that no mites remained). All mites and bees were then counted, and the level of efficacy calculated by dividing the number of mites caught on the sticky board by the total number of mites on the sticky board plus the number remaining on the bees. Results of my first colony sacrifice. Note that 34% of all phoretic mites dropped in the first hour. I only ran the experiment for 1 hour in order to minimize the effect of mite drop from emerging brood. I followed up by later sacrificing two more colonies, with similar results. The efficacy in a double deep colony was somewhat less (~30%). Since Fakhimzadeh had previously determined that the effect of sugar dusting persists for over 24 hours, I guesstimated that the overall drop of phoretic mites would likely be in the 50% range (please do not engrave this number into your brain—I will be discussing it in the next installment). 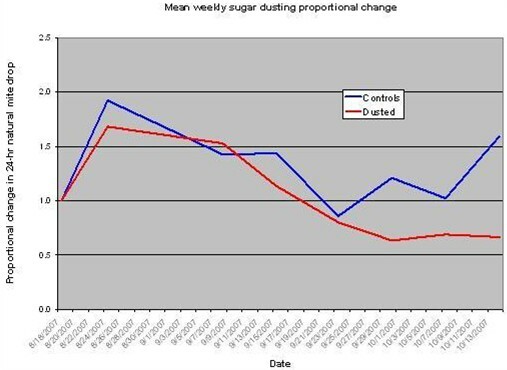 Thus armed, I stuck my neck out even further and created and published a graph to estimate the effect of sugar dusting upon mite population growth. 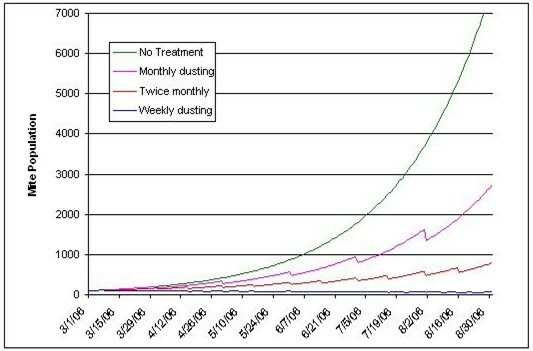 The estimated effect of powdered sugar dusting over a screened bottom on mite population growth, based upon a starting population of 100 mites, a daily intrinsic mite growth rate of 2.4%, and an estimated kill of 50% of the phoretic mites per dusting treatment. Note that weekly dustings would result in a slight decrease in the mite population. These curves are based upon very crude model, and are only for general illustrative purposes, although they tend to match actual field experience. I had hoped for collaborators to confirm these projections by controlled field testing that spring, but unfortunately, it didn’t happen. So in August of 2007 I set up a yard of 20 mite-infested singles (mixed queen stocks), and fed them equally on pollen patties (Mann Lake) and 1:1 sugar syrup continuously to encourage brood rearing (and mite reproduction) for the rest of the season. Half the colonies (randomly chosen) were dusted weekly, the other half left alone except for feeding (in retrospect, I should have done a paired design, since the random coin flip happened to load the test group with a section of the yard that had higher initial mite levels). 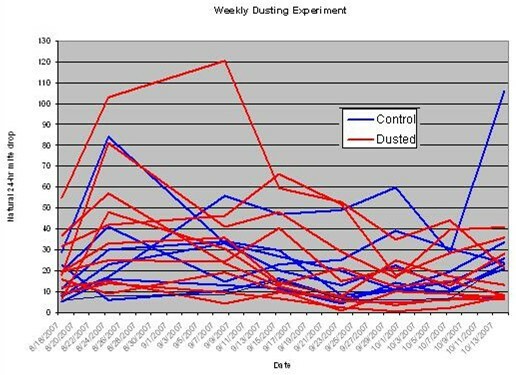 I chose to perform weekly dustings since I wanted to see if the most frequent dusting period practicable would have any effect whatsoever upon mite populations, and I couldn’t imagine any but the most diligent hobbyist dusting any more often. Results of dusting colonies weekly for 8 weeks. I’ve shown the confusing jumble of raw data here to illustrate the great colony-to-colony variability. However, one can note the general trend for the mite drop from control colonies to increase toward the end, and that from dusted colonies to decrease. See below for a simplified version. Graph of the mean proportional change in mite drops, from initial level for each colony. Weekly mite counts were divided by the starting count, so that all colonies begin at a level of 1. Going up to 2.0 would mean that the mite drop doubled from the initial level. Going down to 0.5 would mean that the natural mite drop was half of the beginning level. Although the differences were not statistically significant, it is easy to see that there was a distinct trend for natural mite fall to decrease for the dusted colonies, and to increase for the controls. (For those of you who looked closely at the previous graph, the plots here still look virtually identical if I take out the two treatment and control outliers). Thanks to Dr. Colin Henderson, Univ. Montana, for statistical help. So let’s look at the above graph. For the first week, mite levels increased in both groups. This is to be expected, since most natural mite fall comes from mites coming out of emerging bee brood, as opposed to phoretic mites, so dusting would have little immediate effect. We are likely seeing the typical end of August mite drop spike. Then both groups appeared to decrease, likely because colonies were winding down broodrearing in late August. The trend to note occurs about September 23, after a month of continuous feeding, during which the colonies ramped up broodrearing, as well as the resultant mite levels, as demonstrated by the roughly exponential blue curve for the control colonies. 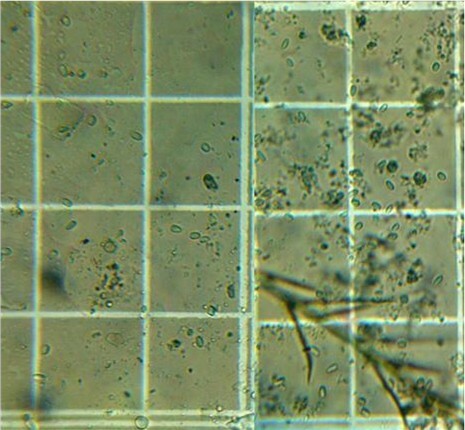 The dusted colonies, however, dropped to below the starting mite level, and then appeared to stabilize—surprisingly similar to the prediction of the mathematical model shown earlier. Attention almond pollinators: Note how late-summer feeding of pollen supplement for the purpose of reinvigorating broodrearing also ramped up mite levels! Such feeding may require readjustments to your mite management strategy. So have we answered the question—does sugar dusting control varroa? This small trial was designed only to determine whether weekly dusting would have any demonstrable affect whatsoever upon mite populations. The answer to that question would be a qualified “yes.” Did weekly dusting drop the mite populations to acceptable levels? I’d have a hard time saying “yes,” since the mite fall of several dusted colonies remained above a conservative natural drop threshold (to be discussed next month). The main point to note is that weekly dusting apparently caused a drop in mite levels in colonies rearing brood (but not drones), but did not make mite populations plummet. Since few beekeepers will consistently dust on a weekly basis, I cannot consider sugar dusting by this method to be a robust mite treatment to save a colony when brood is present. Indeed, a trial (currently in press, by permission) by Dr. Amanda Ellis found no effect upon mite levels in Florida test colonies that were dusted every other week with powdered sugar! (She also found that dusting didn’t appear to hurt the colonies). 1. I dusted weekly, and therefore was much more likely to hit mites while they were phoretic, and more likely to prevent mites from completing multiple reproductive cycles. 2. The humidity in my trial was likely much lower (~20%), which may have given better dust coverage to the bees (there is a big difference when dusting with powdered sugar that has absorbed humidity—pers. obs.). 3. This trial was for short duration, and only in late summer going into fall, when no drone brood was present. Mite populations increase most rapidly in drone brood. 4. The colonies that I tested may have been more naturally mite resistant. 5. I only measured natural mite drop, which is an indirect measurement of mite levels. 6. Other factors, such as the amount of mite immigration from other colonies may have had effects. How can it be, you ask, that when sugar dusting causes so many mites to drop out of a colony, that it wouldn’t have a major effect upon mite populations? It just makes perfect sense! Time and again I’ve found that simply because something makes perfect sense on the face of it, things may be completely different in beekeeping reality. Look back at my simple spreadsheet model—at best, dusting would be expected to simply slow mite population growth, unless done weekly. Even weekly dusting at best would only hold mites at, or somewhat below, the initial level—not decimate them! Any mite immigration from other colonies could potentially offset the benefit. Another answer is that removal of a proportion of the phoretic mites merely decreases competition among the remaining mites. At higher mite infestation levels (which occurred in at least some of Dr. Ellis’ colonies), mites may multiply infest worker or drone cells. Net reproduction per mite is much lower in multiply-infested cells. So by eliminating the competition, dusting may allow the remaining mites to reproduce more efficiently. Repeat dustings at 4-5 day intervals to catch the mites as they emerge from the brood. This would require dustings for at least an entire varroa reproductive cycle (typically 15-20 days during the summer). So at least 4-5 dustings in rapid succession (I have yet to collect hard data to support this suggestion, but my friend Janet Brisson claims good results in California). Or it could be that top dusting simply does not cause enough mites to drop. However, Fakhimzadeh found that more mites dropped in the lab from top dusted, as opposed to blow dusted bees, which is why I top dusted. In addition, I have inspected colonies immediately after top dusting, and found the bees in the bottom brood chamber to be thoroughly covered with dust. I have no reason to doubt that a thorough blow dusting might be quicker and possibly more effective. Indeed, there are commercial blow dusting units offered in Europe. Unfortunately, I haven’t seen any efficacy data for them. Some beekeepers, including Joe Carson, are developing truck-mounted units. A Scirocco sugar duster from Italy. The dust is blasted into the entrance of the hive until it blows out from the propped-up hive cover. Photo courtesy Dr. Joe Carson, who is enthusiastic about these dusters. So is sugar dusting a panacea for mite problems? Unfortunately, no. Then is dusting without merit? Hardly! Sugar dusting can be quite effective for reducing the mite population in broodless (or nearly broodless) bees, such as during summer dearths or in winter (if the bees are not tightly clustered). 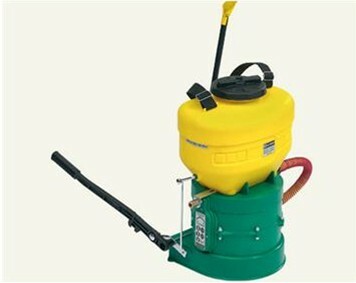 It also works quite well to drop mites from package bees, shook bees, or swarms. Another use is to “clean up” new nucs (best applied at day 7 after the queen begins laying–just before the first brood begins to be sealed). An occasional sugar dusting may also be adequate to assist colonies that already demonstrate varroa sensitive hygiene. Note that the mite growth curve in the graph shown earlier was based upon a relatively robust 2.4% daily rate of mite increase. But mites do not always reproduce that rapidly—in some climates and conditions, or with some bees, the rate may be as little as half that. In those cases, perhaps sugar dusting would provide adequate mite control, perhaps even at less frequent intervals than weekly (I have no data to support this, only anecdotal reports). The application for sugar dusting that I most appreciate is as an “accelerator” for mite drop onto a dry board set under a screened bottom. This technique gives a quick, relatively accurate (data to follow in the next installment) assessment of the level of mite infestation in a colony. I call it the “shoot first and ask questions later” method. You eliminate a substantial proportion of the phoretic mites, and then after a few minutes, you’ve got an idea of the level to which your bees are infested! I’ve used this method extensively over the past two seasons. Dust-accelerated mite drop has the great advantage of giving reasonably accurate results in as little as 10 minutes! Two of us working together can test yards of 36 colonies in about 20 minutes. If you are selecting for mite-resistant breeder queens, this method is great! I will cover the technique more thoroughly in the next installment. To determine whether you have applied enough sugar when top dusting, you should see lines of powdered sugar below the frames on your dry board (shown). Dusting does not hurt the mites, but they get covered in the sugar dust and cannot crawl around. It is best to let them drop through a screened bottom directly onto the ground (and into the mandibles of waiting ants). 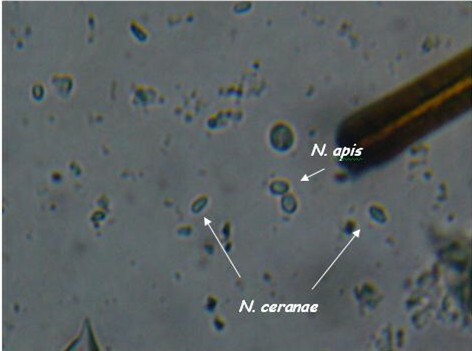 Mites will begin to drop seconds after dusting—I’ve seen 200 drop in the first 30 seconds from a 5-frame colony! 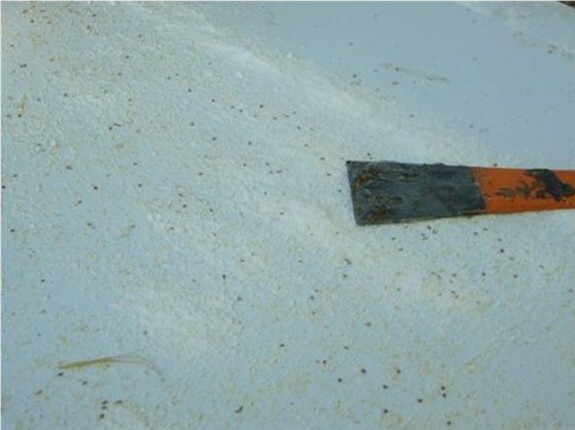 If your colonies contain brood (in which mites will not be affected), then it is likely that the most effective way to use sugar dusting would likely be in combination with drone trapping—a one-two punch. By removing a drone frame exactly every four weeks, and dusting when you replace it, you will remove both the majority of mites in brood, and up to half the phoretic mites. I’ve been planning field trials of this combined method to determine efficacy, but alas, have not yet found the time (maybe next spring). My Chilean friend Juanse Barros, paints his colonies brightly! Since the seasons are reversed in Chile, he collaborates by running tests six months opposite from me. Here, two members of his crew, Edgardo “Taxidriver” Rivas and Luis “Sleepy” Cardenas, are testing a design for a drone trap frame for me. I do not have firm supportive data, but the combination of drone trapping simultaneously with sugar dusting theoretically should really knock back varroa reproduction. Photo by Sr. Juanse Barros (no, Edgardo is not showing off—he just plugged a hole in his coveralls with an entrance-closure sponge). As a final word, I would like to mention a recurring theme that I see during my investigations into mite management methods. 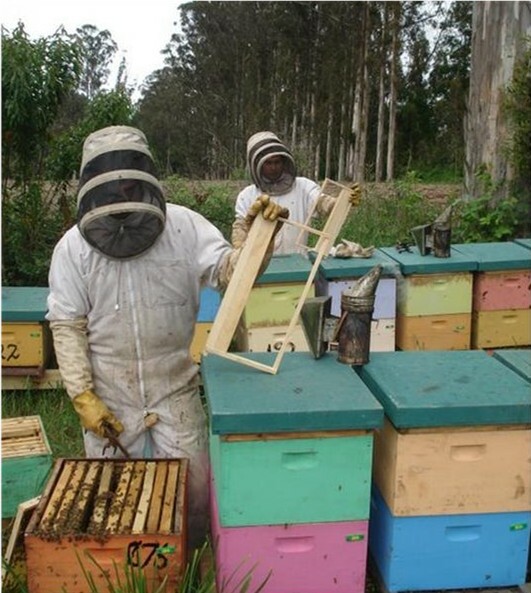 That is that commercial beekeeping and hobby beekeeping are two different animals! Commercial beekeepers cannot afford to risk losing hundred of thousands of dollars should a management method not work. Large commercial beekeepers face problems of scale, such as the need to crowd colonies onto available forage, into pesticide-laden farmland, and into large holding yards. Under those situations, bees suffer stress, and parasites can spread freely. As a result, commercial beekeepers, similarly to commercial livestock producers, generally resort to the insurance of antibiotics and pesticides to avoid devastating losses. Although I encourage minimal chemical use in beekeeping, I completely understand the position of my commercial brethren, and don’t expect them to gamble with the survival of their livestock. Indeed, I am continually impressed by the knowledge, observations, skill, and expertise of commercial beekeepers, and learn a great deal from them. I’ll also be the first to acknowledge that antibiotic- and miticides-heavy commercial operations often produce exceptionally healthy-looking colonies. Unfortunately, this chemical-dependent treadmill is contrary to the natural model, and places beekeepers in the position of only being the next chemical away from disaster. I feel that this is an “immature” state of matters, especially with regard to that permanent new member of the bee colony—the varroa mite. Do we really want to be dependent upon new generations of miticides for the rest of our lives? So let me return to the hobby and sideline beekeepers. They have much more leeway to experiment. In addition, their colonies generally have much better forage available, less competition, and less parasite immigration. There is a huge difference in the progression of mite infestation between small, spread out hobby yards, and large, crowded commercial yards. What works for the hobbyist to manage mite levels may not work at all for the commercial operator! I speak with many hobby and sideline beekeepers these days who successfully keep bees with minimal or no mite treatments. Their losses are often no greater than those of beekeepers who throw everything but the kitchen sink into their hives! 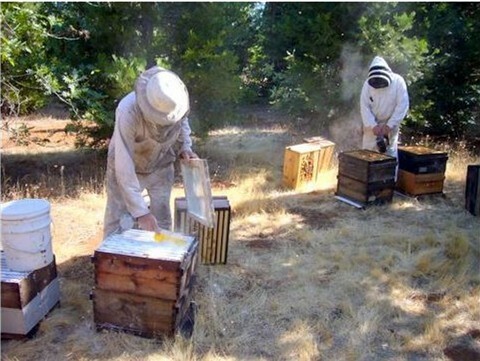 My guess is that the future of beekeeping is being modeled by these very beekeepers. My point is, that a hobbyist may find that sugar dusting, or any other method or treatment, may be enough to help their colonies to survive, especially if they are using Russian, other mite resistant, survivor, or feral stock. However, the flip side is that a beekeeper may completely convince himself that a certain method is “working” since their bees survived last season. In actuality, the bees’ survival may have be due to other factors; the beekeeper’s pet treatment may have been of little more benefit than a placebo, yet made the beekeeper feel good because they were doing something! (This applies to commercial beekeepers, too). I suggest that we be careful of “cures” until they are well proven by controlled trials (using test and control colonies). Bottom line—if you are a hobbyist and use mite resistant stock, then you may be able to get by with minimal mite management. If you use screened bottoms, then sugar dusting is an option that may help. For determining mite infestation levels, sugar dusting is great! In my next article, I will present the results of my field testing of sugar dusting, including mite drop rate hour by hour, a comparison of dust-accelerated mite drop to other sampling methods, and a fresh look at varroa treatment threshold levels. 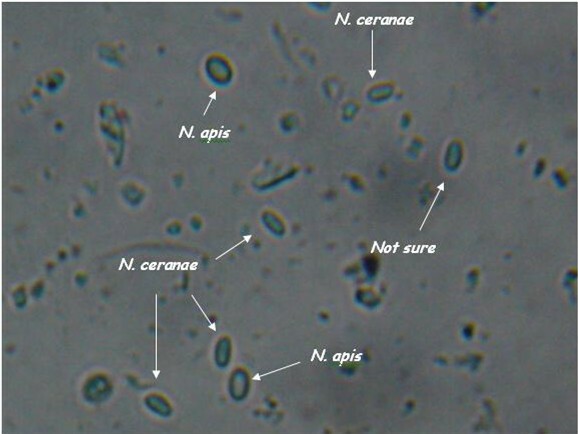 Update: 9 March 2017: Fakhimzadeh, Ellis and Hayes (2011) Physical control of varroa mites (Varroa destructor): the effects of various dust materials on varroa mite fall from adult honey bees (Apis mellifera) in vitro. Journal of Apicultural Research 50(3): 203-211. Some of the tested materials resulted in increased bee mortality, suggesting that control of varroa with dusts is not innocuous to honey bees. Collectively, the data suggest that vacuum collected sugar and ground sugar would be the most promising as field controls for varroa as they promoted high mite fall from adult bees and low adult bee mortality. Off-the-shelf confectioner’s powdered sugar appears to be the best. Finer grinds, although they resulted in better mite drop, also appeared to cause greater bee mortality. And you’d want to avoid confectioner’s sugar that uses anything other than corn starch as a caking agent (their results should also quell the unsubstantiated concern that the corn starch harms the bees). The dusting sugar also needs to be kept very dry once the package is opened. Humidity may well be be a limiting factor in sugar dust efficacy–we may get better results in low-humidity California summers than would beekeepers in humid states. They found that Slovenian powdered sugar (which was the most effective at dropping varroa), was unfortunately quite toxic to adult bees! They presumed that the toxicity was due to the added anticaking agents dicalcium phosphate and silicon dioxide. This is surprising, since the first is a common animal food additive as a mineral source, and the second is made from finely ground quartz, and normally considered to be inert. The cat is finally out of the bag— a Florida company named Beeologics has quietly developed a new product named RemebeeTM— a “viral silencing agent delivered through normal feeding during regular beekeeping practices.” Remebee activates the recently-discovered RNA interference (RNAi) antiviral immune response of honey bees against Israeli Acute Paralysis Virus (IAPV) and Kashmir Bee Virus (KBV). Their chief scientist is Dr. Ilan Sela, who discovered and named IAPV. The company is hoping to receive quick FDA approval for major field trials this fall/winter, and has already made arrangements with several large beekeeping operations. I will be writing more about RNAi in an upcoming article. I’m freshly returned from the California Almond Board’s yearly Honey Bee Seminar. All that I mentioned last month still applies, with the water issue being the 800-lb gorilla, which could affect a third of the almond acreage. Precautionary note: Be careful not to get stuck with unrented colonies if a grower cancels on you due to lack of water! The wholesale price of nutmeats is currently running only slightly above the cost of production, so you can expect growers to be resistant to pollination price increases. But the longterm future looks good for growers who can get water. As far as the colony strength issue, there appears to be a two-tier demand as far as colony strength desired by growers—some will pay premium prices for strong (8+ frame) colonies, whereas others simply want the cheapest white boxes showing bee flight (nominally 4-frame plus or “field run”). As a result, some beekeepers are finding it profitable to split their colonies in fall or winter, add queens, and gross more income from the same bees by putting them into two hives! Beekeepers and brokers who are supplying premium colonies are generally expecting an extra ten spot or two per hive above last years’ prices. Beekeepers receiving such premium payment can expect to have their colonies “graded” to make sure that the growers are getting what they are paying for!